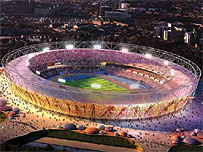 So we were quite thrilled at the prospect of Olympic stadium seats being recycled or sent on quadrennial international duty for future Games, as reported yesterday but it turns out today, new sources got the story a bit wrong. The Chicago Tribune blames The Guardian (which seems fair enough as the Grauniad even wrongly cited Chicago as the capital of Illinois). But, from our friends at Chicagoist and today's Tribune, it seems that organisers on both sides of the pond talked for 10 minutes on the phone, discussing the planning and delivery of a stadium and - on a conceptual level - the possibility of reusing materials, like stainless steel. No sloppy second seats for Chicago then. Shame.